When we started the complete rebuild of the locomotive yard in March of this year, we knew that we had a real task on our hands. After removing the contaminated trackbeds in the area, over 250 tons of fill material and a drainage system have been installed. The experience gained in rebuilding the central area of the Museum last year led us to determine precise levels across the site and after filling material to bottom of trackbed level, a compacted bed was achieved with a vibrating roller across the new yard. 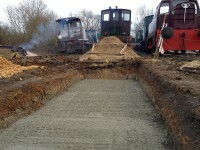 At the rear of the site, we have installed a volunteer pathway to avoid walking across operational track, together with water and power for servicing the fleet under lighting. 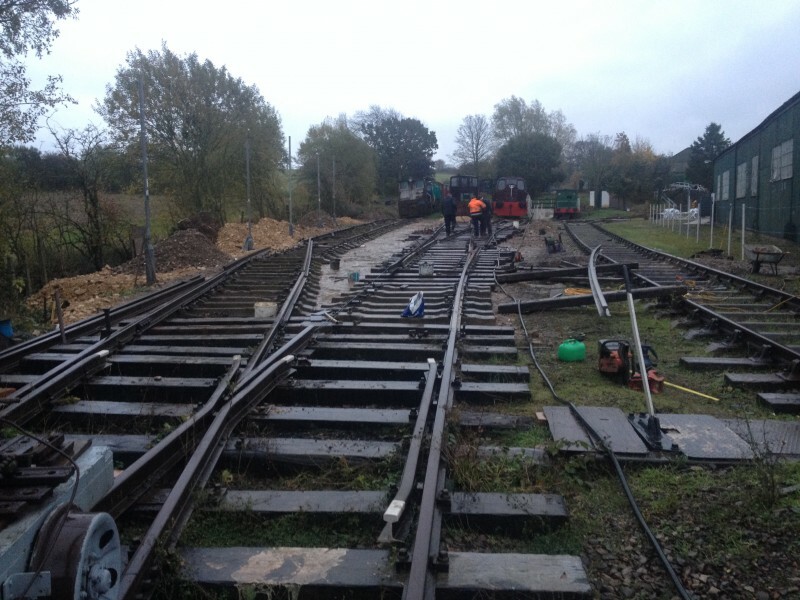 On 20th October, the rails on the pit were connected to the central siding, this being the first track replaced in the new yard. This view in early November shows the extent of progress as the second yard point, known operationally as L2, takes shape – this being a flatbottom point recently recovered from Cemex Barrington after a kind donation by the company. Many young people see the summer holidays as an endless boring series of days with nothing to do! In this area things are different! An enterprising group of 16 young people from Oakham, Stamford and Uppingham chose to spend 30 hours of their vacation making a significant improvement to our Museum under the National Citizen Service Summer programme. 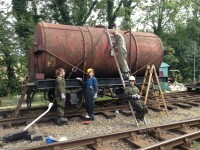 The young volunteers took part in a range of activities including the transformation of our 1926 Charles Roberts water tanker – which although used operationally to service our steam locomotive fleet, has always remained in its ex-industrial condition, rather unloved and bedraggled. Spending the earlier part of the week to remove loose paint, rust and debris, the team of April, Claire, Jacob and Lucy working alongside our own volunteers were able to transform the vehicle into a presentable example of rolling stock worthy of display in our museum environment by the end of their project. Other teams were able to make significant contributions to our community Museum through improving quarry area interpretation, visitor amenities, clearance of line side materials as well as starting to transform our new study centre into a useable facility. The Trustees and Volunteers of our Charity are indebted to these enterprising young people and hope that the experience was as rewarding for them as it has been for the Museum. Our blog updates are usually tales of success and completion of projects at the Museum as the Charity makes progress with its development. Imagine the disappointment when volunteers arrived at the site to find that intruders had tried to gain access to our main gates, failed and then drove cross country across our boundary before breaking into the main workshops and making off with a substantial haul of heritage items, tools and materials stored for our next restoration projects. Of major importance was the theft from the workshop of the original brass draincock valves from VIGILANT, dating to the construction of the locomotive in 1883 and refurbished ready for refitting to the machine. Other heritage thefts included the Wakefield lubricator valves from Hudswell Clarke No. 1308 RHOS, a sandbox cover from Ruston Hornsby locomotive ERIC TONKS and a gauge from Hawthorn Leslie SINGAPORE. The items are all assumed lost but are irreplaceable given their historical and intrinsic importance to the respective locomotive exhibits. Model items were stolen from our Museum displays but the biggest setback was our tool store where a haul of valuable to replace equipment was removed for resale. Our local Police have started to make enquiries but the volunteers have now implemented a series of measures to remove any ‘temptation’ in the future as well as reorganising security measures on site. Without giving any information away, the measures include teeth! If you spot any items which may correspond to the heritage items, please do not hesitate to let us know. We have started to raise funds to replace the equipment lost. 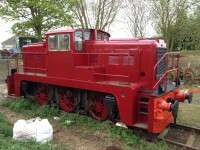 In the build-up to our forthcoming EXTON PARK REVIVAL event on 27th May 2013 which commemorates the 40th anniversary of the closure of ironstone quarrying in Rutland, the engineering team have undertaken to repaint DE5, the Janus locomotive which once worked over the quarry system. When the development team began work on the locomotive yard rebuild it was inevitable that many of the large locomotive exhibits would be stranded as the intervening trackwork was removed. Little did they think that the volunteers would further MAROON the large 440 horse power Yorkshire Engine Company locomotive DE5 with a comprehensive repaint and makeover. Over the Bank Holiday weekend, a team of ten volunteers cleaned, stripped, sanded and prepared the locomotive which was repainted in its original ORE MINING BRANCH maroon livery, complete with red buffer beams and rods, black rims and frames. A further session mid-week saw the marker lights removed, cleaned, painted and replaced to bring the locomotive close to its original appearance. We now intend to complete the cosmetic restoration by replacing its coupling rods, recently refurbished in our workshops, apply lining and lettering and arrange access to the cab for visitors at the event. The popular and highly relevant locomotive is not in operational condition at the moment but visitors could be excused for being mistaken such is the transformation to the exhibit. 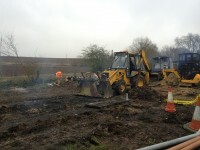 The project to rebuild the loco yard is on the point of starting to replace track onto the site. This week the last load bearing beam had its shuttering removed to reveal the rows of level and aligned retained bolt studs that will secure the bed rails. Work to level the inert fill over the site has already used around 200 tons with a further 100 tons of crushed concrete and sub base track ballast due on the site next week. The Charity thanks its kind supporters from the quarry and minerals industry for their kind assistance. Final preparations for levelling have included re-surveying the site to give the correct gradient profiles across the inspection pit which is level, then graded smoothly down to the coal stage area. This survey has allowed the team to cut back the track to the south of the rebuild area to give a datum from which to relay the track panels using standard lengths with predictable and symmetrical joints through the central area. 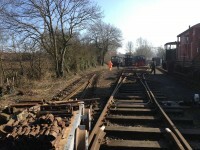 Levelling should be complete by the last week in May when track laying will start in earnest. We are still working to the intended development schedule but work is dependent on securing further 8ft by 12” concrete drainage pipes needed to complete the new culvert at the back of the site. Any offers of assistance/donation would be warmly received! Despite the weather, progress on construction of our locomotive servicing pit has been rapid with the arrival of our building team. Out have come the blocks, concrete mixer and Keith our ever hard-working expert, such that not only have we laid the three courses of double skin blocks that will form the walls of the pit, but we have also completed access steps at one end and the oil intercepting drainage chamber at the other. In the photograph we can see reinforcing bars which have now been installed vertically in the void between the blocks, packed out with concrete. These will form lateral reinforcing for the cap beam which will form the rail bearing top of the construction. Already shuttering is being installed at the top of the blockwork into which the reinforced concrete beam with rail fixings is being cast. If all runs to plan, we hope to cast the beams in the next two weeks and we look forward to installing the rails in early May. 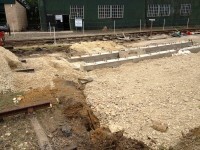 The rail levels will be key to final levelling of the yard to allow track rebuilding to calculated track bed profiles. Last weekend saw more activity in the loco yard as the final clay material was removed from under the track beds and sub-base fill materials were brought in to replace them. The area was originally laid on a clay base with insufficient fill material suitable for storage and maintenance of locomotives. Following leading practice, we have excavated to around three feet depth over the whole site, have laid in surface drainage and then have backfilled with limestone rubble. 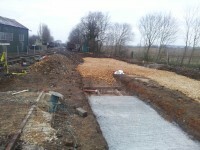 This has been compacted and then a blinding layer has been laid up to track bed and ballast level. By using modern mechanical equipment it has been possible to complete the job to a standard which we could not have hoped to achieve any other way. Our latest photo looking north across the loco yard shows the inspection pit base and the track bed formations at sub-base level and before the blinding layers are added. We hope to complete this phase in the next working day. It seems barely credible but the day saw concrete poured to form the base of the inspection pit. In a well scripted series of operations, the initial site works included the crucial drainage pipes from the inspection pit to the main drains with provision for an oil interceptor. In addition the team were able to install a large concrete sectional pipe in the drainage stream to the rear of the site to create a safe walking route around all three of the loco roads, never before possible. This area will not be developed but will allow the lighting columns to be installed in the current phase of work. The main achievement of the day was the pouring of the base slab of the new inspection pit – which will have a depth of around one metre below rail height. The natural falling gradient in the yard at this point is being compensated to give a level and safe working area. The picture reveals the preservation era fill on this part of the site and the natural clay through which the excavations took place. 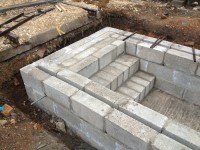 It is intended to start block laying in a weeks’ time and already our expert mason is ready to make a good start. Progress continues to be rapid as Day 5 saw the end of site stripping, ditch clearance and tree felling to allow the site excavations to start in earnest. The eastern boundary of the site includes an open drainage ditch and the original railway company fence but both had been overtaken by years of undergrowth. The team have stripped all of the excess material and will start to prepare a large piped culvert to replace the open ditch. This will not only create a safe walkway but will allow ground maintenance to take place and the original hedge to regrow. After a week of extreme gardening and clearance of all material in the yard, our hardy team of volunteers saw the arrival of the larger excavator yesterday to start stripping the yard of the poor quality ash and ballast surface layers. A dumper will take spoil to our digger playpen so that the material will have a future operational use for demonstrations with the dragline and Euclid lorry paring. 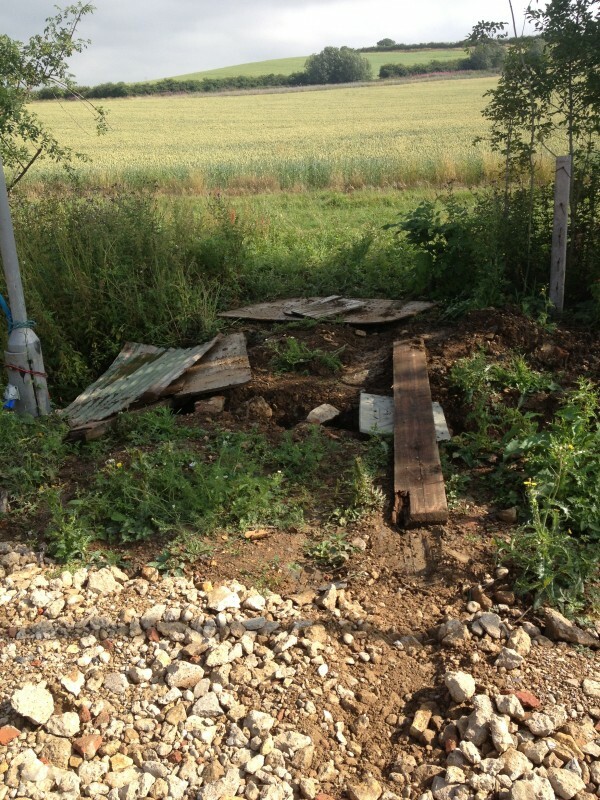 After the surface is bared, the drainage and services runs will be dug before the inspection pit is excavated. All change (again) at Cottesmore! Many thought that the major Rocks by Rail rebuild and relaunch in 2013 would have seen the end of heavy rebuilding at the Museum but this has just inspired the volunteers to press ahead with completing the remaining jobs. Attention has therefore turned to rebuilding the locomotive yard approaches and will see not only completion of water tower and servicing facilities but also the major track replacement programme in the yard throat as a precursor to the proposed and long awaited three road museum and workshop building. This work will allow drainage, lighting and power points to be provided in the area to improve the operational capability of the working exhibits. It will also allow construction of a servicing and inspection pit and a wash down area to ease maintenance pressure. The project started on Tuesday 19th February with a willing team of volunteers who started to lift the track in the area. By the evening all of the rail had been lifted together with the pointwork at L2, our reference for the second point in the loco yard. Day two saw the sleepers lifted ready for removal and felling of the trees and hedge which had choked the drainage ditch to the rear of the site. This will be put into a culvert and levelled to allow a safe walking route to the rear of the site as well as the location of lighting posts to improve the working conditions in the area. The volunteers also laid a temporary ‘haul road’ into the site ready for the excavators which will level the site, remove poor draining clay and then dig drainage and service ditches before preparing the new track beds. Day three allowed us to remove all of the sleepers from the site and it looks as if we can look forward to site development starting within a week of starting the project! 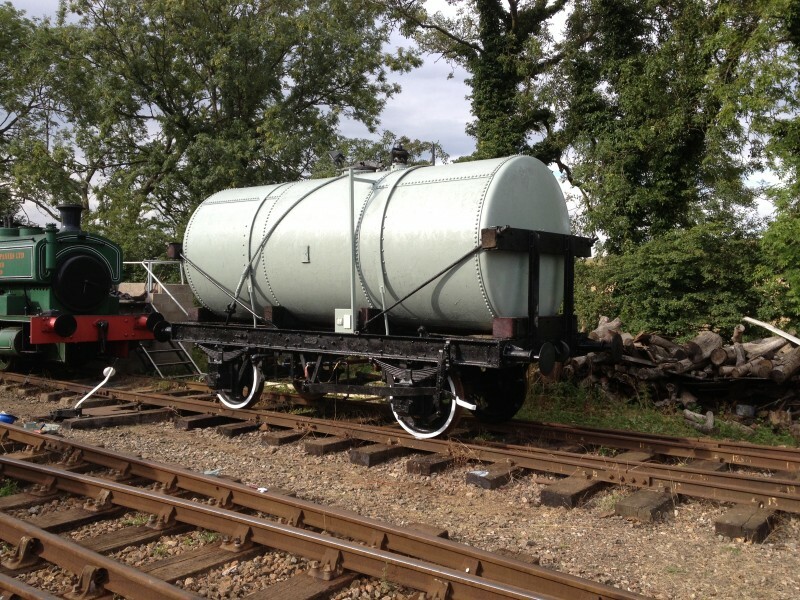 The photograph shows progress on day one with some track lifted and the welcome into service for our new Wickham platelayers trolley, recently acquired from a Sussex railway museum and after a repaint appropriately but unofficially named ‘Lavender’! See Wickham Blog for further detail.